The murder of unarmed Black men by police, and the courts’ refusal to charge them with any crime, has sparked a massive wave of protest marches, sit-ins and school walk-outs. Driving the struggle forward are working-class and poor Black and Latino youth who know this is a fight for their lives. The movement began in Ferguson, Missouri, where protesters courageously refused to be driven from the streets by militarized police and the National Guard after Michael Brown was gunned down in broad daylight. And it has spread to practically every city in the country. Now Eric Garner’s tragic last words before he died in the chokehold of a New York City cop – “I can’t breathe!” – are being echoed in protests across the country and internationally. 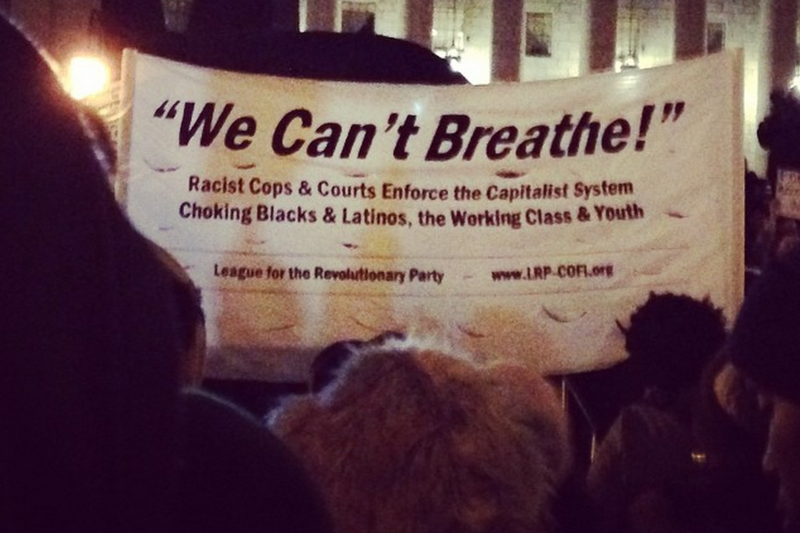 Tens of thousands are chanting “We can't breathe!” because they too are caught in a chokehold, not just by police and courts that are ready to condemn them to prison for the slightest infraction (real or imagined), but also by a capitalist economy in which minimum-wage jobs or unemployment are increasingly the only future available. Many see that behind the racist criminalization of people of color is an economic system that has always relied on exploiting them as low-wage labor in the toughest jobs. And the protests are winning the support and participation of many white working-class people and youth too. Since the economic crisis broke out on Wall Street, while the banks got bailed out with trillions of dollars, the working class has been left to drown in rising debts, falling wages and unemployment. Blacks and Latinos have suffered the worst. The fact that funding for public schools and colleges has continued to be cut while billions more government dollars have been directed to police and prisons has sent a clear message to young working-class people of color especially that they must accept a life of miserable jobs and poverty or face a life in prison or death on the streets. Today’s protests are a mighty rebellion against all these worsening injustices. The Black and Latino working-class youth who have taken to the streets in protest have set an inspiring example. They have affirmed their dignity in the face of racist politicians and the media slandering them as “thugs.” They have proven their courage by refusing to be intimidated by massive mobilizations of heavily armed police against them. And in doing so they have sparked a movement through which the oppressed are beginning to discover the power they have when united in mass action. This movement can win more concrete victories too. Elected politicians are already wondering what concessions will need to be made in the hopes of quelling the movement before it becomes even stronger. A continued and growing uprising can force them to pull the police back from their worst abuses, if only temporarily. It can force the Federal courts to charge and jail killer cops who have been allowed to walk free by local courts and make other cops think twice before firing their guns –although the authorities’ refusal to act so far shows how strongly they will try to avoid this. Other reforms are being raised in the movement that could add some new formal limits to police powers. One such demand is to end the transfer of military equipment to local police forces. Protesters in Ferguson, Missouri who have been confronted by police with automatic weapons and armored vehicles would certainly support such a ban. But they also know its limits since Missouri’s governor ordered the military itself – soldiers of the National Guard – to join the police in occupying their neighborhoods. In New York the “Right to Know Act” being considered by the City Council would require that police identify themselves and tell people that they have a right to refuse being searched, before they stop and frisk people on the street without evidence of a crime. Such a new law is meant give hope to young people of color that they will have new grounds to defend themselves from police harassment. But they already know that the cops break such laws every day and get away with it. No wonder most don’t think reforms will seriously change the police. Indeed, a small but growing number have been emboldened by the power of the current protests to say it will take a revolution to win freedom and justice for all. They are right. All levels of government, with their cops, courts and prisons, enforce the law and order of a capitalist society in which a minority enjoy great wealth at the expense of the vast majority. The system relies on racism to divide and conquer the working class by criminalizing, brutalizing, and super-exploiting people of color. Capitalism’s economic crises, and the competition among its corporations to exploit their workers ever more intensely, drives rising unemployment, falling wages and cuts to social services. Racism guarantees that people of color suffer the worst. Ruling-class mouthpieces blame the system’s victims, saying a lack of discipline, morality and hard work are responsible for their poverty. This anti-working class garbage combines with the poisonous racism that sees Blacks and all people of color as would-be criminals to set the stage for the cops’ daily harassment and brutality. And as the world capitalist economy slides toward another Great Depression, the system can only offer worse racism and repression. The cops and courts “serve and protect” the ruling class of capitalists against the masses of working-class people they exploit. That’s why nothing has been done to prosecute Wall Street financiers who stole billions, drove the economy into crisis and forced millions into joblessness and home foreclosures. And it’s why the police focus on the infinitely smaller “crimes” of the poor, as they did when they targeted Eric Garner for allegedly selling untaxed cigarettes on the street. The fight for justice for victims of police abuse and for reforms that limit police powers can win limited and temporary relief from some of the worst police abuses. But the most important thing about such struggles lies beyond this. The more that mass struggles test the possibilities of reforming the system, the more working-class people can become convinced that it will take a revolution to win their demands. And by showing the great power the masses have when they unite in action and become more organized to fight in defense of their interests, mass struggles can show that revolution is not only necessary, but possible. People of color will succeed in liberating themselves from racist oppression only when the capitalist system that sustains it, and the capitalist state that defends it, are overthrown. We believe that the rising struggles against oppression and exploitation must culminate in revolutions that put the working class and oppressed people in power, running a workers’ state that defends their interests. A workers’ state would reorganize the economy to provide for the needs of all, not the profit of a few, and build a socialist society of freedom and abundance for all. By removing the cutthroat competition over scarce resources that capitalism creates and that racism thrives on, such a state would ensure that the struggles of Black people and all people of color finally vanquish the horrors of racism forever. To overthrow capitalism, the working class will have to unite across the lines of racial division that the ruling class encourages. That means white workers must be convinced to support and actively join the fight against racism – and they can be. Through generations of heroic struggle in this country, Black people have rebelled against slavery and seen it defeated; they have and risen up against segregation in the South and won the right to vote; and through their struggles Black people, along with Latinos and immigrants, have won the respect of white workers to the point where today most reject open expressions of racism. Today many white working-class people look at the current protests with sympathy and some are already joining them. Now, by standing up insistently against racist injustice, young working-class Blacks and Latinos are not just defending themselves – they are also providing an example that the entire working class can learn to follow. Though poverty and injustice hit people of color hardest, capitalism’s crisis is hitting white working-class people hard too. More and more whites are finding themselves trapped in low-paying jobs and falling deeper into poverty. And although they do not suffer the same widespread horrors as Blacks and Latinos, white working-class people are not exempt from the abuses of the capitalist state’s cops and courts. The current uprising of protests can inspire united working-class struggles against all the capitalists’ attacks. For a revolution to ultimately succeed, we believe the masses must find a revolutionary political party of the most militant and class-conscious workers and youth that, guided by a Marxist analysis of capitalism such as we’ve presented here, is able to draw out the lessons of each new struggle and lead them toward to victory. The experience of capitalism’s harshest exploitation means that Blacks, Latinos and immigrants will play a particularly great role in this revolutionary leadership of the working class. And the current uprising of struggle has sharply exposed the crisis of political leadership that people of color and the whole working class faces. Today’s protests are a mighty rebellion, not only against the worsening injustices suffered by people of color, but also against all the politicians, community and labor “leaders” who claim to represent oppressed people and the broader working class – but who have done nothing to organize a real fightback against years of assaults on their rights and living standards. The working-class Black and Latino youth who have pushed this movement forward have been acting in place of this bankrupt leadership. But the usual types of sellout "leaders" who enjoy lives of power and privilege by claiming to represent exploited and oppressed people are trying to mislead the struggle away from the streets and direct action where the masses can exercise some power, and into the dead end of voting for Democratic Party politicians who have betrayed their promises to Blacks, Latinos and all working-class people time and again. For example, after activists had spent weeks organizing for a march of millions in New York set for Saturday, December 13, Rev. Al Sharpton responded by calling for a march on Washington on the same day. With the help of media attention, he hopes to take control of the movement by dividing it and leading people to place their hopes for justice in President Obama and future elections. In the face of the open racism and anti-working class policies of the Republicans, the Democrats have played an invaluable role for the ruling class by posing as the friends of oppressed and working-class people, helping to divert popular anger away from mass action and toward passive voting and hoping for meager reforms. But the fact that the Democratic Party is no alternative for working-class people stands starkly exposed today. The six years since Barack Obama’s campaign promising “hope” and “change” won him election as this country’s first Black President have provided Blacks, Latinos and the entire working class with a painful but important educational experience. Despite hopes that he would undo worsening poverty and injustice, Obama bailed out Wall Street and abandoned the working class; he has responded to the increased suffering of Blacks and Latinos in particular with eloquent speeches covering a refusal to take any meaningful action; he has promised fairness to immigrants but ordered the deportation of record numbers. And despite vowing to end the United States’ war-mongering abroad, he is now sending more troops to Afghanistan and Iraq and expanding its imperialist bombing campaigns in the region. Indeed as the world’s Chief of Police, Obama’s bombs and drone missiles kill more unarmed and innocent people of color abroad than the racist police do at home. And like the racist local District Attorneys who let killer cops go free, despite the new Congressional report detailing widespread cases of gruesome torture and murder by the CIA, he is refusing to charge those responsible with any crime. Capitalism means worsening exploitation, racism and imperialist war. Obama’s presidency in particular shows that the Democratic Party is a loyal servant of the ruling capitalist class no less than the Republicans. Its image as a friend of working-class and oppressed people only serves to divert the masses from organizing protests and strikes and other forms of mass struggle that are their only real means to defend their interests. Today’s uprising against racist police brutality and the system that gives rise to it shows that this lesson is beginning to be learned especially among those who suffer the system’s worst injustices. As such it can be a long-overdue turning point in this country’s history. Now it is necessary for the most militant and politically conscious young working-class Blacks and Latinos, as well as whites who are committed to an uncompromising struggle against racism, to come together to offer an alternative way forward. We aim to convince revolutionary-minded young people of the need to build a revolutionary socialist working-class party that can lead today’s struggles toward the revolutionary solution. And as part of this, we want to suggest some immediate steps which we think could prove decisive for the movement to continue and grow. Mass movements that rise up quickly can lose momentum and disappear just as fast unless they have clear demands that answer the most urgent needs of the masses and inspire in them the confidence that the movement’s goals are worth the sacrifice of ongoing struggle. Protests against the injustices of the cops and courts are particularly vulnerable to this because on one level or another, the masses sense that the state power they are targeting is unable to be meaningfully reformed. But the many thousands of young working-class Blacks and Latinos who are mobilizing in protest today, along with the significant numbers of whites who support their struggle, are rising up not just against racist and brutal police, but against the rapidly diminishing opportunities for a better life symbolized by the closing of schools and the construction of more prisons, and the miserable choice between poverty-wage jobs and unemployment. If today’s movement is to grow and not fade away, it must begin to more clearly raise basic demands that not only challenge racist police injustice, but also address the needs felt most desperately by working-class youth for education and meaningful jobs at a living wage. Furthermore, the lack of any mass organizations that can unite the young working-class protesters and coordinate an ongoing struggle must be addressed. So far the protests against the cops and courts’ injustices have been large and inspiring, but they have generally ended with most people simply going home to wait to hear about the next event. This leaves the vast majority of people who join the protests without any ongoing structure through which they can stay active in the struggle. And it leaves them without a forum where they can voice their opinions on the way forward, consider the ideas of others, and democratically vote on the next steps. Organizing in places like schools and workplaces is crucial, but if the working-class youth who are the key to this movement are to form the structure needed for it to continue, it will most effectively be built from the protests that are bringing them together. Some existing activist groups have made important contributions to the movement, but most protesters don’t even know these groups exist. The need for organization to sustain the mass struggle can’t wait for the masses of protesters to choose to join any of these groups. But if such groups could cooperate in following up protests by calling for mass assemblies where protesters could voice their opinions in an organized discussion and democratically vote on the way forward, the new mass organizations that the struggle needs can begin to take shape. In such assemblies, we revolutionary socialists would work with others to fight for key, far-reaching demands that connect the struggle against the injustices of the police, courts and prisons to economic demands that address the working class’s most urgent needs. In New York, for example, we would support the demand to Jail the Killer Cops responsible for the death of Eric Garner and other recent victims of the police, to Throw Out Police Chief Bratton and to End the “Broken Windows” Program that targets Blacks and Latinos, the working class, poor and youth. And everywhere we would fight for Money for Schools, Not for Jails, specifically demanding increased funding for public schools and colleges to open up educational opportunities for working-class youth, and for Jobs for All at a Living Wage. Additional demands to address the specific needs of the working class in different parts of the country are also important. For example, in New York demands for an Indefinite Freeze of Subway Fares and Rent are essential to stop the rise of two essential expenses that are making life an ever more desperate struggle to survive. And the demand to create More Affordable Housing is also important. We think demands like these are crucial to inspiring broader and ongoing participation in the movement. And wherever there are demands, there must be a center of power on which to raise them. Since the cops are under control of city governments which can also begin to address these economic demands, a next best step for the movement could be to organize marches on City Halls to raise such demands. If they are successful, mass assemblies could lead to the creation of new organizations of struggle for the working class and oppressed that are desperately needed. At the same time, we cannot ignore the existing organizations of the working class, even when their corrupt leaders have held back struggle for so long that few imagine they could play a helpful role – the trade unions. Beneath the bureaucrats who control them, the unions’ working-class members can be awakened to the potential power they have by the rising struggles outside them. By raising demands on their union leaders to mobilize the ranks in support of the protest movement, militant union members can begin to organize an alternative leadership committed to the struggle – and either pressure the current leaders to take steps forward or at least expose those leaders and thus take a step forward to ousting them. That’s what the League for the Revolutionary Party’s supporters among New York’s subway and bus workers are doing, for example, with their newsletter Revolutionary Transit Worker and campaigns inside the Transport Workers Union. The ultimate success of all struggles against oppression and exploitation hinges on the extent to which the working class comes to the fore of the struggle. Working-class people can exercise some power through mass protests, but it is through strikes and other forms of workplace action that they can really shut the capitalist system down to press for their demands. It is in capitalism’s workplaces where workers are brought together in cooperative labor that the system creates the strongest potential for collective struggle and political consciousness. That is central to the working class ultimately overthrowing capitalism and working together to build a socialist society of freedom and abundance for all. With this bulletin we in the League for the Revolutionary Party hope we have provided both practical proposals that can help advance the struggle, as well as a clear explanation of the roots of racism and police brutality and why we believe workers’ socialist revolution is the only solution. We urge interested readers to contact us to discuss these ideas more and consider joining our effort to build the revolutionary party that workers and oppressed people need to lead their struggles to victory. No Support to Capitalism’s Racist, Anti-Worker Police! Democrats and Republicans – Two Parties of Racism, Austerity and Imperialist War!